Day 2 of the RS:X European Championships taking place at the Club Nautic Arenal, Mallorca. 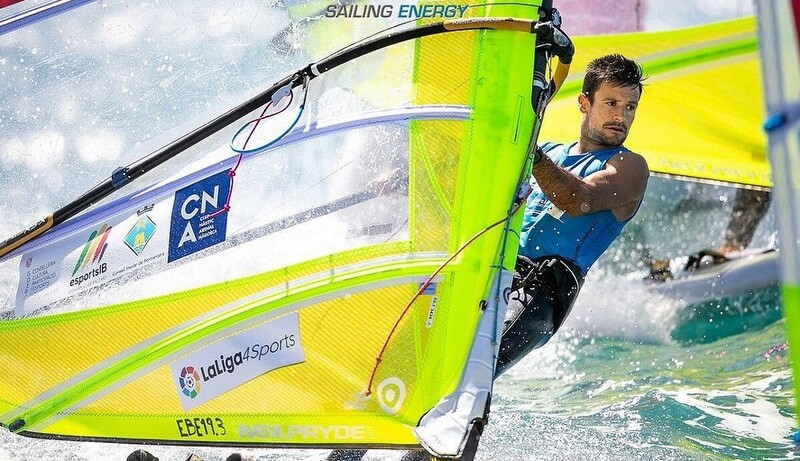 In the men, the leader after two more races is Louis Giard (3,5) of France, who is five points ahead of Le Coq Pierre (3,6) in second and in third is Kiran Badloe (1,4) of Holland. Moving into contention is double Olympic champion Dorian van Rijsselberge (12,3) now in 7th place, in a four-way points tie. Britain’s Tom Squires (5,16) is up into 12th and Kieran Holmes-Martin scored a couple of second places to jump into 14th place. Andy Brown (10,7) is 20th. In the women’s event Charline Picon (3,3) of France takes a three point lead ahead of Noy Drihan of Israel (33,1) with Yue Tan (19,3) in third place. In the Youth events with three more races completed, Vardimon Tomer (3,4,7) of Israel retains his lead in the men and Natasa Lappa of Cyprus (13,4,4) is new leader in the women. Best placed British youth competitors are, Finn Hawkins in 10th in the men and Mollie Densley-Robins 27th in the women. As the all important split at the end of Wednesday’s racing, there was a flurry of protests at the end of racing and all results are provisional at the time of writing – the Jury working late into the night to make the right and fair decisions for the protests heard.